There are some handy tools that can help you develop against our API. Before you commit code into your codebase, you can test writes and design reads right from in the browser. 1. OData uri conventions documentation. Our API closely adheres to these conventions with a few additional extensions. 3. Tester for importing / posting data. 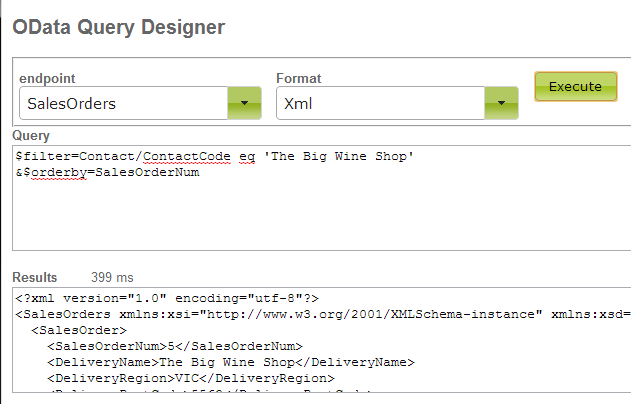 Every endpoint has an import view mode eg: https://app.vinsight.net/SalesOrders?view-mode=import that allows you to paste json, xml or csv to test that you have the format and data correct saving you hours of iteration time. Simply append ?view-mode=import to the query string of an endpoint. These endpoints should provide you detailed errors on what does not validate and where you may be going wrong.